When we saw Worldwindows blog Papa John’s a few weeks ago, we got pretty excited! 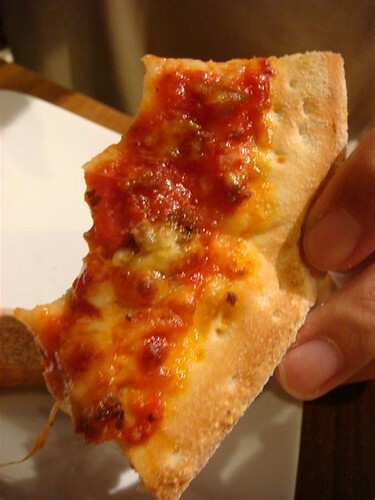 This was Cumi’s all time favourite student’s pizza take away/delivery (CUMI: There were Little Caesars too!!! Pizza! Pizza!) whilst studying in the states and he was really eager to see it if was still as good as he remembered. Me, I just wanted Pizza. Fullstop.The red herring was Cumi kept looking at Tropicana City for the outlet to open because of the advertisements. 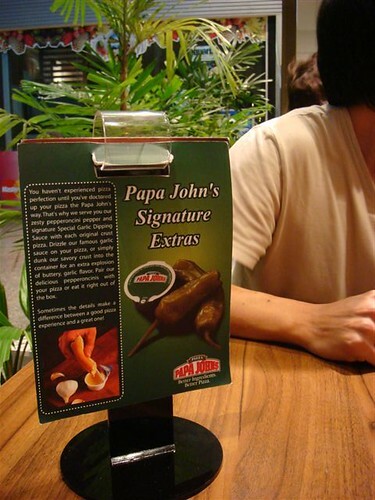 However, it was Berjaya Time square that opened the 1st Papa John’s outlet. 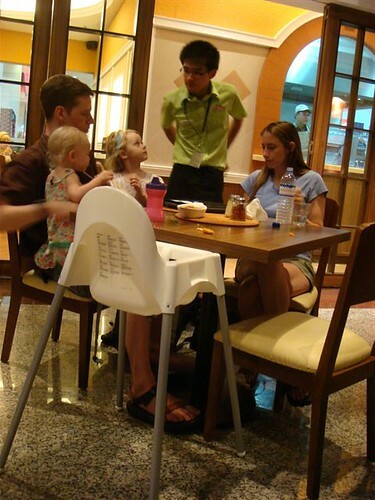 We heard the little girl exclaim to the waiter “But it’s nothing like the one BACK HOME” (huge sad blues eyes)… and Cumi’s expectations fell.. but the girl was so sad, so forlorn so cute.. I just wanted to hug her! Me, I had no expectations. I only needed lardy cheezy pizza.. and oh yea, some of those famous side dips that they keep talking about. The breadsticks were fair. Apparently more chewy and ‘gooey’ in the states. These were a little hard. Well, the highlight for me was the GARLIC BUTTER dip. 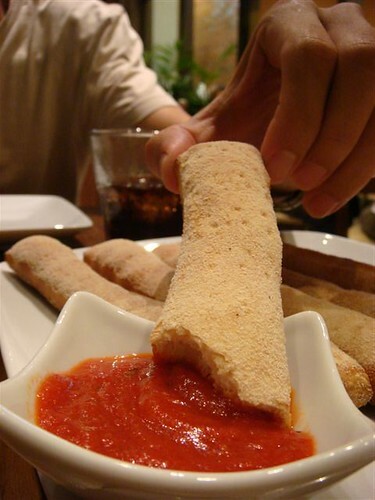 Way back then, Papa John’s came up with this great money saver.. an idea to reduce wastage of pizza crust and encourage people to clean up leftovers, by creating dips for just that purpose. Though the ingredients in the States are far superior (chewier dough, stringier cheese, heavier/chunkier tomato base), Papa John’s in Malaysia would now have to rank as my favourite pizza place, oh yeah.. For sure. gosh…must have those delicious looking garlic butter! Shall be diving all next week, Lembeh aka Manado beckons, so keep the blogging torch burning whilst I am away!! Whoa… seems like not bad. hmmm, i very rarely can get myself to eat pizzas in restaurants these days. so, good ah? nice..their sauce base is just so-so fresh! yeah the garlic butter is to die for!!!! sooooo tempting. and the cheese sticks beat Pizza Hut’s hands down, with REAL melted cheese. the pickled jalapeno is a novelty though. cant match the pizza, nor the pasta. 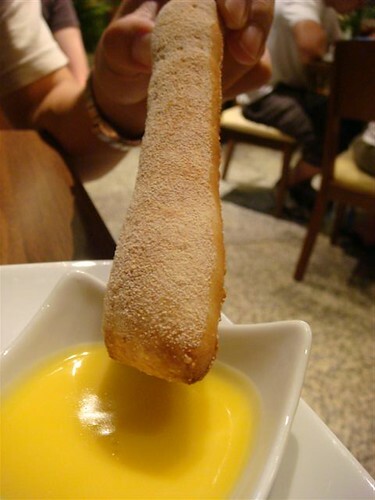 there will always be slight variations on the quality… things will always taste better at their home place. wowow.. so many post of Papa Johns suddenly.. and all has comments on hw bad Pizza hut is! LOL. one must inform their PR dept real real soon! The papa John’s hard stick does look pretty impressive even we will be proud of ! We have papa johns here, but only takeaways, not restaurants. 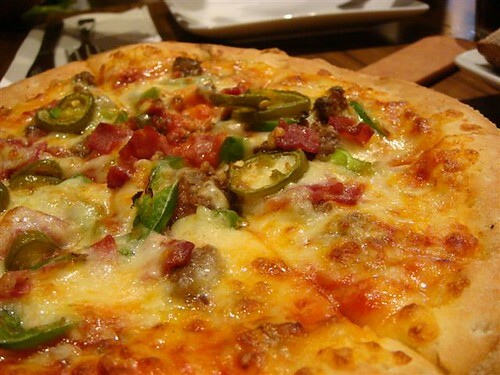 I think the pizza in Malaysia also suffers from not having pork in it, especially my favourite topping, peperoni. On the other hand, it is dirt cheap compared to the UK! at first, i thought it was a bread papa rip off…din know it was a pizza joint, lol! yea, go give it a try! happy diving.. and hurry back with photos! romantic.. and nicer if you WIN! Mwhahahaha! hehe.. i know .. us too! but now should be cheaper right.. what with the tumbling exchange rate..